When Courtney Taborn joined Career Communications Group’s JobMatch in 2015, chances are employers weren’t sure what to make of the service. Career Communications Group (CCG) has long been a company that combined the best of content production and distribution, advertising, and public relations. But a lot has changed over time. A hiring service once used a couple of times a year at CCG job fairs, has now emerged as a driver leveraging the 30-year old firm. Adoption of CCG’s JobMatch Service is growing in leaps and bounds. Candidates come from Accreditation Board for Engineering and Technology (ABET)-accredited schools at black colleges and universities (HBCUs), Hispanic-serving institutions (HSIs), Tribal Colleges, and local community colleges. JobMatch uptake hasn’t just soared; recent surveys show 90 percent of JobMatch users are “very satisfied” or “satisfied” with the service. “Most excitingly, we have begun the process of interviews for participants before our conferences,” Taborn adds. Over its annual nine-month conference cycle, CCG holds two major events. 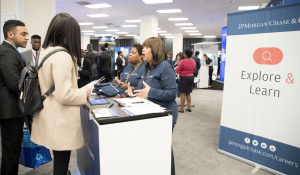 Last February, they hosted the 32nd Annual BEYA STEM Conference in Washington D.C. and this fall, they held the 23rd Annual Women of Color STEM Conference in Detroit, Michigan. 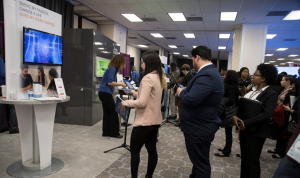 The 2018 BEYA STEM conference topped 10,800. Student numbers came in at more than 4,690. Of that total, more than 58 percent were male and 41.7 percent female. College seniors comprised more than 35 percent of the undergraduates, with juniors making up 26.2 percent, sophomores, 15.5 percent, and first-year students at 10.5 percent. Graduate students came in at 8.9 percent. Taborn hopes to “onboard” more CCG’s partners to increase awareness of the JobMatch program. 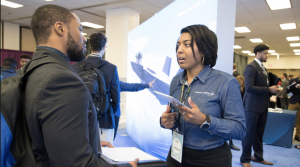 Corporate partners include Lockheed Martin, longtime co-host of the BEYA STEM Conference; Northrop Grumman, Boeing, Raytheon, General Motors and other employers that consistently make CCG’s list of top science, technology, engineering and math (STEM) education supporters in Black Engineer, Hispanic Engineer, and Women of Color magazines, all published by CCG. Taborn’s also working on Readiness Certification, a training program with its seminars at CCG’s conferences. “The objective of CCG JobMatch’s Job Readiness Certification is to help prepare talented individuals for extraordinary careers,” Taborn explains. Many of the professionals at CCG events, or in the pages of its magazines, are in the highest paying jobs in R&D, innovation, software development, IT, integrated circuit design, data science and analytics, and performance. “You can expect to see updated branding, online portals, websites, and a more robust online learning platform in the next 12 months,” she said. Jennifer Roberts joined CCG as a Customer Success Manager in 2018. She’s not planning on reshaping the model, because “the winning strategy of JobMatch comes back to sticking to CCG’s primary goal,” she says. Since 1987, CCG has been connecting diverse talent with top-tier organizations embracing inclusion for decades. Roberts also said one of the biggest trends is the refocus on diversity. “Companies are making diversity a key part of their culture. As a result, we have never been more relevant,” she says. “I think that having that connection with the candidate and understanding what they want and need out of the position helps make sure that no one on both ends gets ghosted,” Turner said. Alma Mater works: Connect with classmates, other networking groups even career services. Join Industry Groups: Find every association that matches up to what you want in a career. Make those connections and become stronger by attending events. Link in: Engage on LinkedIn and connect with professionals and leaders in your field. Volunteer: Join a club or start one. You meet all sorts of people from various walks of life. Have a goal when networking. Listen first, then speak so that you stay focused. Lastly, do a follow-up to stay engaged. 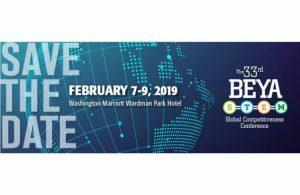 The 2019 BEYA STEM Conference will take place Feb 7-9 at the Washington Marriott Wardman Park in Washington, D.C.